Many of the great composers were prolific letter writers and the letters they left behind – to friends, patrons, siblings and lovers – are a fascinating insight into some of the greatest people who ever lived. 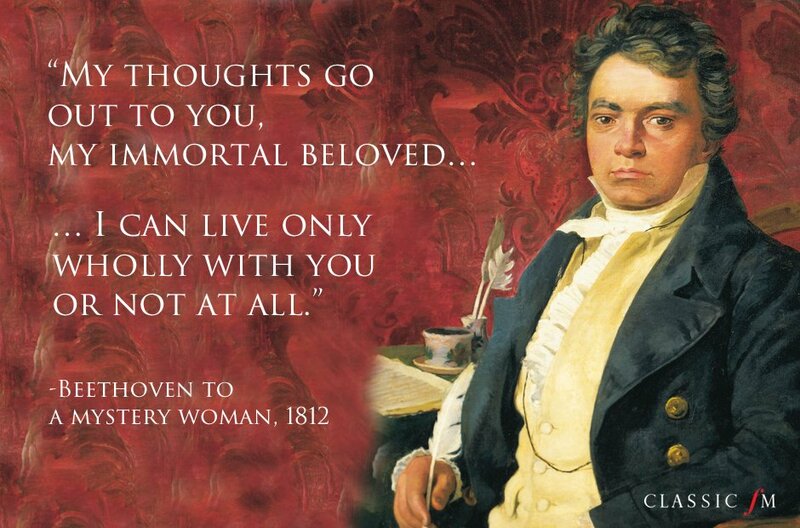 "My thoughts go out to you, my immortal beloved… I can live only wholly with you or not at all." "I lie under apple-trees and huge oaks, I eat strawberries with my coffee, at dinner and supper." "There can be scarcely anything more agreeable than to enjoy the green country on an evening after a hot summer's day. My heart warmed within me." "Today I took my breakfast on the veranda. There's nothing like it on Earth." "I hear music constantly in the empty silence, while the intellect is still and all emotional strings are relaxed." "Some day the press will awake to the fact that the living centre of music in Great Britain… is not London but somewhere further North." "Sometimes, I would station myself in the midst of a landscape in harmony with my mood, and some passage from the Aeneid, would come back to me." "The thought that this paper is going to be in your hands fills me with joy and brings tears to my eyes." "Oh! how happy should I now be, had I my full sense of hearing." "I wish I could write to you as tenderly as I love you and tell you all the good things that I wish you. You are so infinitely dear to me, dearer than I can say." "I always said God was against art and I still believe it." "In the afternoon I went for a solitary skate... A light drizzle came on; the ice gleamed, producing a watery reflection of the trees, the sky and my flying figure." "Noël! Noël! The bells are cracked. Noël! Noël! They have wept too long!"